Yo! In this article I'll answer the questions, what does dropshipping mean? And how does it work? I'm going to keep this article short and sweet so here we go. Dropshipping is where you sell products on your site then you get someone else to fulfil the order. Normally the manufacturer is the one to ship the order direct to your customer. That means you don't hold any products/inventory yourself and then when you get a sale you pay the manufacturer and they take care of the fulfilment. This means you as the seller never see or handle the product. Dropshipping is a low-risk business as you don't have to purchase any inventory and store it somewhere in the hope of selling it. With dropshipping you can start selling a product on your store and if it sells then you can just pay the manufacturer to ship to your customer, this means they take all the risk. AliExpress is where a lot of dropshippers get their products from. Click here to see how to find hot new dropshipping products. The customer comes to your website then places an order on your site, you then forward the order to the vendor/dropshipper (normally the manufacturer), they then ship the product and your customer soon after receives what they ordered. This is a great way to test products without the risk of buying stock. It's how I do it. You can see my story about going from $0-$50000 with my first dropshipping store at the bottom of this page. There are both advantages and disadvantages with dropshipping. Firstly let's start with the positives. So there you have. 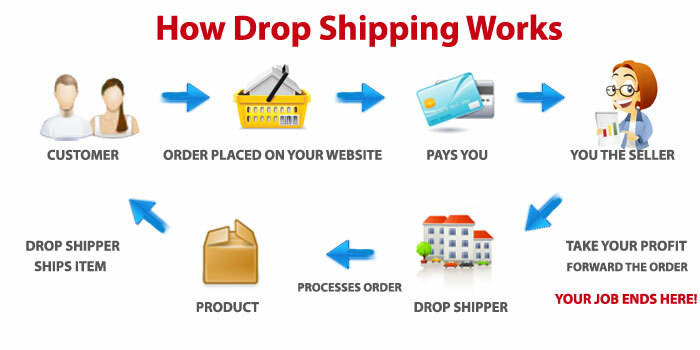 Hopefully, now you know what does dropshipping mean and how it works. You'll love this business because of the flexibility and low-risk nature. P.S If you want to want to know about the eCommerce platform I use for dropshipping then check out CommerceHQ , it will save you money and increase your conversions. There's also a comparison I did with Shopify and Commerce HQ you might want to see so you can see how much better it really is.